I’ve been asked why and how I started teaching bluegrass jamming. 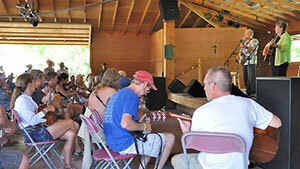 For years many students I’d meet at banjo camps would come pretty discouraged. They had nice instruments and were trying hard, but were about to quit, saying, “I’m not very good.” But I think the real problem was that the teaching was not right for their real needs and skills. Most people start playing an instrument with the idea that they’ll learn to play with others. If they do start doing that, even with few skills, it’s fun and it lays an important part of their foundation as a musician. As they learn the basics of playing rhythm, their finger skills and their ear skills develop. 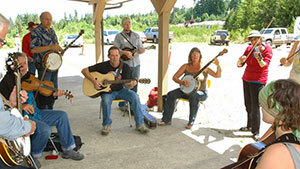 Bluegrass music is not just a solo activity like classical guitar or painting. Individual skill is needed, but so are interactive skills. Some can be learned right from the beginning of learning to play music: following two-chord patterns while keeping rhythm, singing and playing new songs with ease. 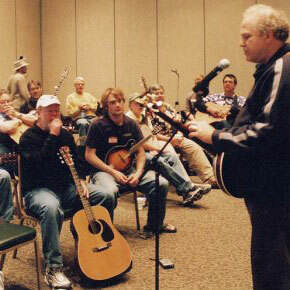 Teamwork is at the foundation of bluegrass, so we teach about the informal interactions and how jamming works. We want a new musician to start having fun right away. That’s what music is all about, after all -- yet many teaching methods have a way of turning it into drudgery. I was lucky when I started playing banjo, to have friends who played and sang three-chord folk songs by Pete Seeger and others. I learned to follow chord changes. When I started trying to figure out Scruggs style banjo it helped to have the ear skills I got from playing folk music. I made great friends jamming and was very motivated to excel, partly just to get to play with better musicians. What I’ve learned in over 40 years of teaching is that motivation is #1, and it’s strongly influenced by social factors. The fun of playing with others, even at a very simple level, creates a growing involvement. It’s also the foundation for the challenges ahead. But alas, most teachers are what I refer to as “tab vending machines”, an exaggeration of course, but the point is: Bluegrass musicianship is not about “reciting”, that is, delivering exact notes from memory or a printed page. While that’s a good skill, soloing in a jam is usually improvised, not “performance/recital” music as classical music is. Instrumental tunes might be memorized, but when people play bluegrass together, the material is almost always songs not instrumental pieces. Songs are easier to jam on, since rhythm playing and singing (even from a printed page) is all that’s needed to make music. Faking solos for simple songs is a big part of bluegrass jamming. Though I taught jam skills at all my banjo camps, years ago someone urged me to try teaching just “bluegrass jamming” for banjo. To do that, I invited students on other instruments. Soon I saw there was a teaching gap for other instruments too. So I started weekly classes nearby in Boulder, Colorado. They went well, and helped me develop methods of teaching jamming. 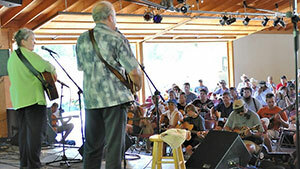 My first full jam camp was at Merlefest in North Carolina in 1999, and I’ve now done over 80. I made three play-along DVDs teaching jamming, and developed the LetsPick.org web site to help new bluegrass musicians. Jamming can be done by anyone. Our classes just require four chords: G, C, D, and A (basses and fiddles need to know which notes go with which chord). Soloing is not required. We teach whatever jam skills each person needs: how to follow chords, how to lead a song, fake a solo, sing harmony, etc. We aim for each student to become confident in a slow bluegrass jam. The next goal is to really add to a jam in various ways. We teach harder skills for those ready, so we take experienced jammers along with the novices. Some would say that couldn’t work, but we make it work! Advanced players can benefit greatly from slow jams. I tell them, if the speed and the chords are easy, you can work on playing the melody correctly in your solo, and singing good harmony on the choruses. Those harder jobs keep the more advanced players challenged and helpful to the jam, while others play basic rhythm. In 2011 I launched Wernick Method Jam Classes with a group of teachers I knew and trusted. We have training text, video and audio. The first year, classes from 6 to 26 people took place all over the U.S., in Canada, and Australia too. We now have taught over 1300 students and have over 60 certified teachers! For more info, visit LetsPick.org.